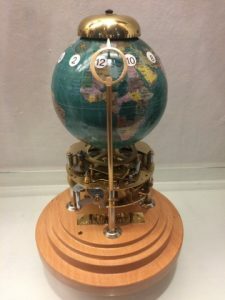 Hand crafted by Rob James and his team, the new numbered limited edition globe clock is available with different types of hard wood bases to your specification and will be a fine collector’s item. 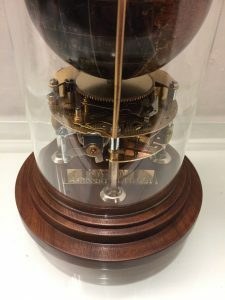 The unique design allows the globe to rotate once in 24 hours and the minute bell to rotate once an hour with a striking mechanism sounding on a bell. 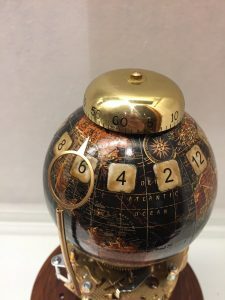 Twelve noon will be aligned over London GMT (or any time zone you live in) and the globe can be supplied in a vintage or modern look (dark and light blue respectively). 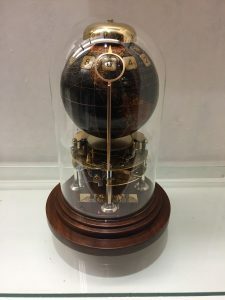 The domes are German made glass whilst the mechanism has an eight-day duration and is based on a German made mechanism, modified by ourselves to suit the purpose of this clock. Please contact us with your specifications and to discuss delivery.